The author of Remarkable Creatures (2010) and Burning Bright (2008) invites writers to turn one of the most famous lines in English literature into short fiction. As Chevalier notes in her introduction, it’s the declarative, fiercely self-determined tone of Jane Eyre’s words that captures the imagination. And, by addressing us directly, Jane makes us her confidants, witnesses, and accomplices. There’s no question that Charlotte Brontë has inspired generations of writers—especially women. Here, Jane’s bold statement serves as a prompt for a distinguished group of authors. 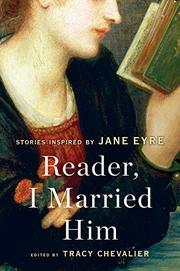 Some of these stories address Jane Eyre directly. “Grace Poole Her Testimony,” by Helen Dunmore, is a chilling condemnation of both Jane and Rochester, full of heart-stopping lines. In “Reader, She Married Me,” Salley Vickers offers Rochester’s point of view, while Francine Prose turns Rochester into a Bluebeard. Audrey Niffenegger brings Jane and her dear friend Helen into the future to create a dystopian romance. And Kirsty Gunn’s “Dangerous Dogs” is a sly exploration of Brontë’s masterpiece, methods, and biography narrated by a fledgling writer. In many entries, though, the connection to Brontë’s work is more oblique, with Jane’s words largely severed from their original context. Emma Donoghue uses the life and letters of Mary Benson, wife to an Archbishop of Canterbury, to craft a sad and tender story of love between women. Lionel Shriver’s tale of a new widow’s war on her neighbor’s tree is an unalloyed delight. As for the contribution from the always wondrous Jane Gardam, best to let the reader experience it without preamble. A clever idea well-executed; a treat for fans of short fiction and for Brontë’s many ardent fans.